A reporter with Abia Fact Newspaper has just confirmed that Joy Akabuike who was involved in a highly publicised motor accident is alive. 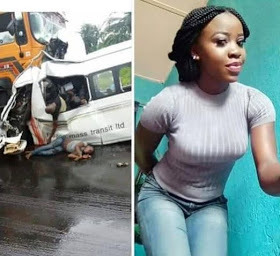 She is alleged to have regained consciousness days after the ghastly accident in which other passengers were confirmed dead last Sunday May 22nd in Umuahia, Abia State. Cheers to quick recovery.